Odell came into being with the arrival of the Kansas City, Mexico and Orient Railroad in 1908. J. T. Odell is the town's namesake and although there had been a town named Haulk just two miles away, the population was drawn off of Haulk, lured by the opportunities the railroad offered. A post office was opened in April of 1909 and ten years later the town was thriving with 30 businesses, including a newspaper. In time, Odell could boast 5 different churches. 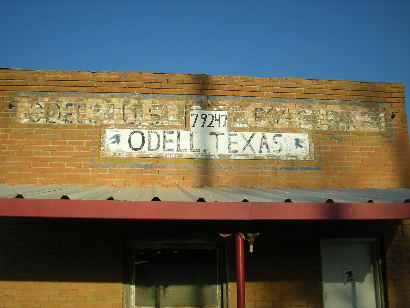 In the prosperous 20s, Odell had over 800 citizens but The Great Depression took its toll and several fires caused a lot of damage to Odell's main street. By the end of WWII only eight businesses were left and the population was a mere 301. It declined to just 130 - nearly the same figure given today. 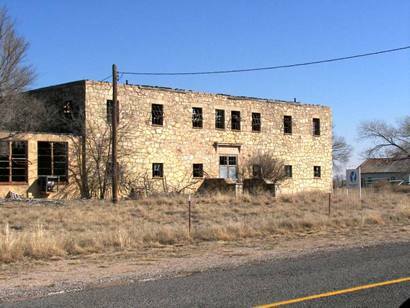 "Included is an updated photo(s) of the Odell, Texas Post Office building that is now closed. After years of weathering the painted signage for the Post Office building has faded away to reveal a former purpose for the tiny building. Looking closely at the top banner - on either side of the zip code designation - you should be able to make out the block letters of "MARKET CAFE"... 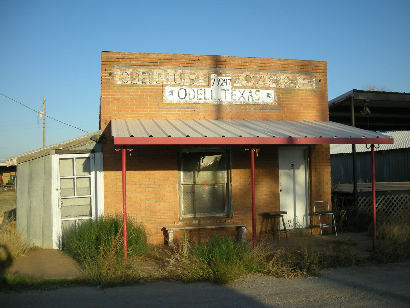 This small building is the last remaining "original" business building in the town still in its original location. According to the publication "Wilbarger County, Texas 1858 - 1986"; Wilbarger County Historical Commission (1986), a hand-drawn map of Odell between 1925 - 1935 shows two cafes in this general area. As cafes would commonly also serve as a meat market in this era it would explain the building's "ice house" designation. I also learned from the current owner that the walls insulated with cork are found only in the rear portion of the building. In this same publication I have been able to verify that the current Primitive Baptist Church was the first public school building for Odell. 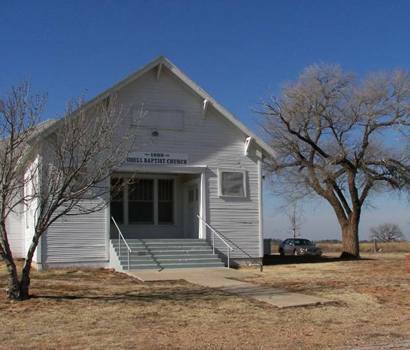 A larger, brick school building was erected in another part of town in 1912. The old Odell Post Office. Once an ice house. 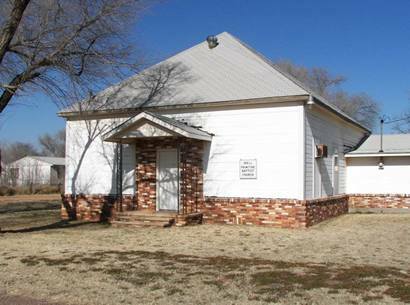 Odell Primitive Baptist Church, the first public school building for Odell. 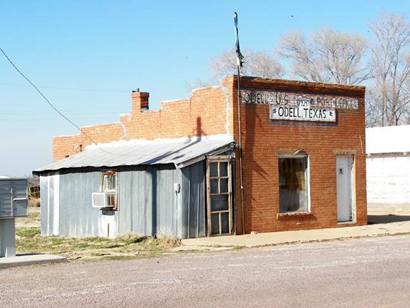 Thank you for the inclusion of Odell (Wilbarger County) in your features. I was born there and my Dad worked for the Atchison, Topeka, and Santa Fe Railroad. We lived in the concrete 揵unk houses� built for railroad employees that lie just west of the 3-way cross roads. Dad moved with the railroad jobs but we returned there in the mid-fifties and re-built the house that lies [near] between the Primitive Baptist Church. I can attest to the existence of the five churches and report that my youthful employment included mowing the lawns of all of them and the small patch beside the old post office; a task that netted me 50 cents. The much larger church grounds could bring me as much as $5 for several hours labor. All five churches remained active until the early 1970抯 with only the 1890 Baptist and the Primitive Baptist holding services today. Your photo of the Odell School is primarily the gymnasium built by the WPA in the 1930抯. The flagstone staircase banisters at the entry once held a brass plaque reporting this fact. The plaque has since been scavenged by a souvenir hunter. The main school building was even older and sat to the north of the gym. In the 1950抯 the single-story structure was added between the two and while the north face of the gym building was opened for construction there came a heavy rain that caused the hardwood flooring of the basketball court on that end to warp severely. This became an important strategy in our game plan during my school years. The post office building was once an ice house and the walls are lined with cork for insulation. Today it is used as a sound recording studio by a local resident. 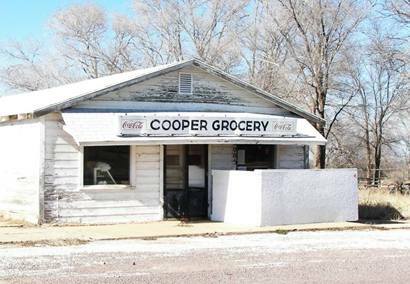 Mrs. Cooper ran the small grocery from my earliest memory until just a few years ago. The walls of the store were filled with collections of wallet size 揝chool Days� photos of the children who frequented her store from the community and the school. I personally achieved a priceless baseball card collection by trading her empty pop bottles found along the roadside. A reunion called Odell Days is held each year on the last Saturday in April. It features live bands, barbeque, arts & crafts, a car show, and lots of fellowship while serving as a fundraiser for the town抯 volunteer fire department. I invite you to check www.odell.coyotedream.com for photos of this event and a pencil drawing depicting Odell (circa 1914).